Cave Diving in Full Force! I made it back from another incredible trip to Mexico with Connie and Bert. I was happy that we were able to dive a few places (Tres Estrellas, the Mayan Alter at Dos Ojos, and more) that were new to me and go back to others that I could go back to again and again (Caracol, Kolimba, etc.). Personally, I cannot recommend Connie's trips enough and if anyone has any questions, please feel free to ask me. The picture to the right was taken in a cave called Temple of Doom. The photographer (Don Currie) did an exceptional job capturing me progressing through a halocline. Don is an amazing photographer and a great cave diver. I am happy he will be joining us this year at Weeki Wachee. 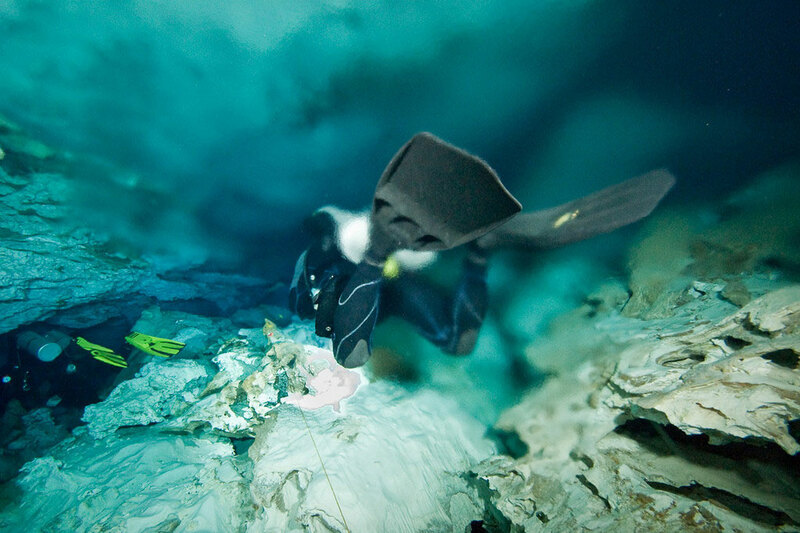 Speaking of Weeki Wachee, my return has found me knee deep in Karst Underwater Research's return to Weeki Wachee for our 2009 Exploration season. Already, we have conducted numerous familiarization dives for new team members and built staging ares inside the cave to allow divers to start decompression earlier in the cave and also to get rid of some of their gear earlier. If you are following the explorations at Weeki Wachee, I will be writing a weekly blog describing each week's diving that can be read here and for those that are really into technology, I am also twittering about this year's exploration progress. Click here to check out what we are doing in a little more real time. I have added a new feature to the cave system pages, it is now possible to subscribe to an RSS for each system that will let you know when a new condition report has been posted as well as showing historical condition reports. Look for the RSS icon - - on the right of each system page. For those of you that let me know that you read and follow this blog, MANY THANKS! Let me know what else you would like to see on the site.